ElliptiGO owners love riding their bike! But sometimes the weather doesn't cooperate, or maybe it's a great day to stay inside and focus on the workout (or catch up on some TV shows). Whatever the reason, ElliptiGOers have found many creative ways to ride their steed indoors. Check out these setups. Kyle Merber is a professional middle distance runner whose primary goal for the 2016 season was to qualify for the Rio Olympics in the 1500m. 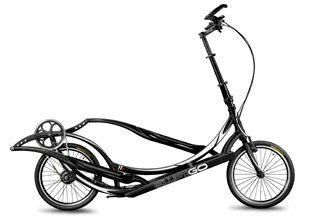 But when he suffered a sacral stress reaction that took him away from running for a full five weeks, he began cross-training on an ElliptiGO elliptical bike. The fitness he built up allowed him to salvage the season and still qualify for and compete in the Olympic Trials final. In the 2016 Chicago Marathon, after making ElliptiGO rides an integral part of his training, Brian Pilcher rewrote the record books as he passed through nearly every major checkpoint, establishing new U.S. 60–64 marks for the half marathon, 25K and 30K. A new study conducted by researchers from leading universities and hospitals in the United States found that just 30 minutes of moderate exercise, done five times a week, can save you $2500 a year. Cross-training has been demonstrated both by academic research and by elite masters athletes to maintain running fitness while reducing the occurrence and severity of injuries. We provide here two new research studies and a video of a discussion between four-time Olympian Meb Keflezighi and the former president of the American College of Sports Medicine (ACSM) Annual Meeting. For a handful of ElliptiGO athletes, the conclusion of the U.S. Olympic Track and Field Trials was just one more step leading to their ultimate goal – participating in the Rio 2016 Olympics. Emily Infeld, Colleen Quiqley, Kate Grace and Shannon Rowbury all qualified to participate in the Games, joining Meb Keflezighi, who had previously qualified in the US Olympic Marathon Trials, as well as several ElliptiGO athletes from other countries. With the opening ceremonies of the Rio 2016 Olympics now less than 45 days away, excitement is rapidly rising in the track and field world. For USA Olympic hopefuls, their biggest opportunity to date begins with the Olympic Team Trials, July 1-10, in Eugene, Oregon. ElliptiGO will be in “Tracktown, USA” supporting scores of athletes who train on ElliptiGO bikes and providing opportunities for the community to experience elliptical cycling.